1,700 people read this post. How powerful is this oath? Whilst the deeper meaning of this aayat are numerous, Allah tells us in Surah al – Tin, that the fruit harvested from the fig tree, is the fruit that He has taken a promise by. A fruit that profits the indulger. Described as a soft pear-shaped fruit with a sweet dark flesh containing many small seeds, the fig is the oldest fruit related to the Mulberry tree family. Figs can be eaten fresh perceived as a visibly pink flesh or brown when dried, but is equally nutritious and enjoyable. Not only does the fig fruit serve as a cure to ailments, but when fully ripe, the fig can be a delicious delectably-sweet fruit. Rich in fibre; the fig fruit aids in digestion and can prevent colon and related cancers if ingested daily. Also a facilitator in cholesterol, figs also regulate blood sugar. Diets of persons containing figs have substantial evidence to prove its claims of preventing cancer and heart disease. Whilst the body cannot manufacture Omega 6 and Omega 3, figs contain both these Omegas and Phytosterol which aids in the proper functioning of the brain, heart and nervous system. Poisons are also proven to be expelled from the body by eating figs. • Prevent constipation: There are 5 grams of fiber per three-fig serving. So, it helps in healthy bowel function and prevents constipation. • Weight loss: The fiber in figs also helps to reduce weight and is recommended for obese people. Take care – figs also result in weight gain, especially when consumed with milk. • Lower cholesterol: Figs contain Pectin, a soluble fiber. When fiber goes through the digestive system, it mops up globes of cholesterol and carries them out of body. • Prevent coronary heart disease: Dried figs contain phenol, Omega-3 and Omega-6. These fatty acids reduce the risk of coronary heart disease. • Prevent colon cancer: The presence of fiber helps to mop up and usher out cancer causing substances. • Protection against post-menopausal breast cancer: Fiber content in figs give protection against breast cancer. • Prevention of hypertension: People used to take more sodium in the form of salt. Low potassium and high sodium level may lead to hypertension. Figs are high in potassium but low in sodium. So, it helps to avoid hypertension. • Sexual weakness: Figs are known since ages for reducing sexual weakness. Soak 2-3 figs in milk overnight and eat them in the morning to enhance your sexual power. It also helps in gaining weight. • Strengthens bones: Figs are rich in Calcium. Calcium helps to strengthen bones. • Urinary calcium loss: People having high salt diet may be affected by increased urinary calcium loss. Potassium content in figs helps to avoid that. • Prevent macular degeneration: Vision loss in older people is due to macular degeneration. Fruits and figs generally are good for avoiding this condition. • Relief for throat: The high mucilage content in figs, helps to heal and protect sore throats. Figs are quite useful in various respiratory disorders including whooping cough and asthma. Since they are also good for digestion, they help in treating constipation, indigestion, stomach ache, etc. Figs are also good for fever, earache, boils, abscesses, venereal diseases and is excellent for the liver. 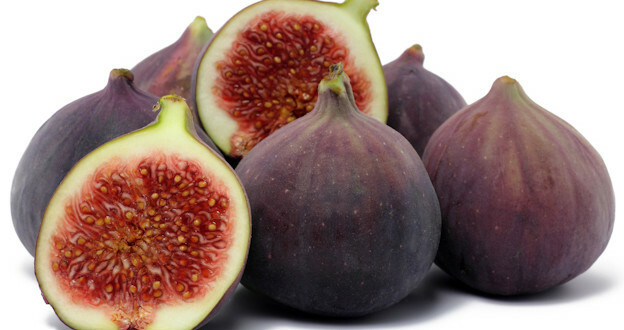 Fig is a highly alkaline food, therefore helps to regulate the pH of the body. Figs are rich in flavonoids and polyphenols. These are antioxidants, which prevent the damage caused by free radicals. Fig is known for its soothing and laxative properties. Figs are low in fat and sugar. The leaves of figs have been used also for diabetes, ringworm, warts and shingles. For diabetes a tea is made from the leaves. For skin infections a tea is made with the leaves and is then applied to the skin. Time to toss all those harmful chemically based creams because figs are also excellent for the skin. They are very helpful in the reducing the appearance of dark circles under the eyes, as well as removing fine lines and wrinkles. Enjoyed as a snack, figs are a healthier alternative to your store bought chocolate and sweets. With more flavor and high nutrition, figs are the way to go!